Weeks ago, the seasonal bombardment of Christmas music started. But here is a song arguably worth listening to. It has Asbury Park-area flavor, “Christmas on the Jersey Shore,” written in 2011 by Neptune’s Ray Dahrouge and performed by Dahrouge and his group, the Darchaes. The Darchaes on the song are originals Sam Siciliano of Neptune, Dennis Testa of Jackson and Louie Scalpati of Neptune City, along with Siciliano’s brother, Patsy of Spring Lake, who has filled in with the group over the years. Actually, the Darchaes formed in 1960, combining guys already on the Asbury Park doo-wop area music scene. About this time, an American doo-wop group, the Marcels, had its first hit with “Blue Moon.” Locally, Marcel Darche was a meat-retailer. Throw in Marcel, alter the meat man’s surname, the name Darchaes is born. This was the Sound of Asbury Park (SOAP) pre-Bruce Springsteen and Southside Johnny and the Asbury Jukes. “We were writing our own songs…,” said Dahrouge, now 71. Ray Dahrouge and Sam Siciliano. Coaster photo. In 1961, the Darchaes got a contract with Brooklyn’s Aljon records, which suggested the group change its name to Ray and the Darchaes. Two Dahrouge-written songs, “Little Girl So Fine” and “Carol” were on either side of the 45 record. “Ray was 19, I was 15 on our first record,” Sam Siciliano said. “We figured this was our big break,” Sam Siciliano said. “Our last shot,” Dahrouge said. As it turned out, the Aljon record was the group’s only one under contract. So, after the unsuccessful try with “To Get A Hold On You,” the group split for members to go their own ways. “I just wanted to be a songwriter,” Dahrouge said. “He was gifted,” said Sam Siciliano. Filling in with other work to make a living, such as a beer salesman and doing ceramic tile work, Dahrouge successfully wrote songs. More than 200 songs written or co-written by Dahrouge have been recorded by other recording artists, such as the Manhattans; Helen Reddy; Engelbert Humperdinck; Jeffrey Osborne; and Ray, Goodman and Brown. Dahrouge also continued as a singer, and other members of the Darchaes continued to perform locally. 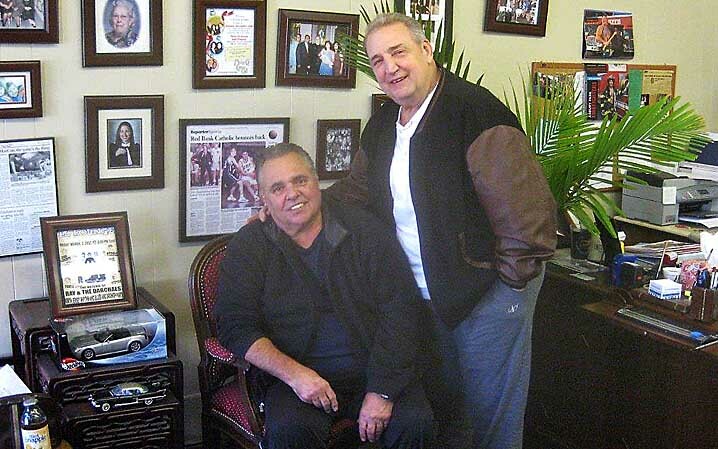 Today, Patsy Siciliano fronts Patsy Siciliano and the PS4, which includes Sam Siciliano. On “Christmas on the Jersey Shore,” Dahrouge sang lead, while the others sang in harmony arranged by Sam Siciliano. Tommy Jones of Brielle did the arrangements and composed the music digitally with Steve Calafati of Neptune Township on guitar. On the Internet, there are various unauthorized postings of Dahrouge-Darchaes songs. Unauthorized equals the artists not getting paid for their work. “Back in the old days, I would get royalty checks,” said Dahrouge, talking about when a radio station played one of his songs. “I feel bad for the musicians, the (music) industry, everybody that got hurt (by not getting paid),” Sam Siciliano said. “In the music business, the artists and publishers will never recapture (the money). If one listens to “Christmas on the Jersey Shore on YouTube, the end contains a cappella harmonizing – suggested by PJ Noce, a North Jersey man who engineered the song — done by the Darchaes at Patsy Siciliano’s real estate office in Neptune City. “I love that ending,” Sam Siciliano said. Ray and the Darchaes, 1961 to 2012, can be purchased at Patsy Siciliano’s real estate office, 201 W. Sylvania Ave., Neptune City, or through Internet sites selling recorded music, such as www.amazon.com. Posted in Special Features and tagged Joe Sapia, Music.